The easiest way I’ve found to determine the amount of oil you need is to place the turkey into the fryer and fill with water until the turkey is just covered. Remove turkey and allow to drain, pat dry with paper towels as well. Make note of the level of water in the fryer. Discard water and dry thoroughly. Fill frying vessel with oil to the level as noted above. This should help in preventing hot oil spill overs. Layer a large platter with food-safe paper bags. Rinse turkey, and thoroughly pat dry with paper towels. Rub Creole seasoning over turkey inside and out. Make sure the hole at the neck is open at least 2 inches so the oil can flow freely through the bird. Place the whole onion and turkey in drain basket. The turkey should be placed in basket neck end first. Slowly lower basket into hot oil to completely cover turkey. Maintain the temperature of the oil at 350 degrees F, and cook turkey for 3 1/2 minutes per pound, about 45 minutes. Carefully remove basket from oil, and drain turkey. Insert a meat thermometer into the thickest part of the thigh; the internal temperature must be 180 degrees F.
Prepare an outdoor grill for indirect medium heat, and lightly oil grate. Rinse turkey, and pat dry. Place turkey breast side down on the prepared grill. Sear turkey on both sides until skin is golden to dark brown. In a large roasting pan, mix together the water, bouillon powder, garlic powder, onion powder, poultry seasoning, parsley, and paprika. Place turkey breast side down in the roasting pan. Scoop the pan mixture over the turkey. Cover tightly with foil and place on grill. Grill 3 to 4 hours, until the internal temperature of the thigh reaches 180F. Remove turkey from grill and let stand 15 minutes before carving. Mix well. You may need to adjust the amounts depending on the size of your bird. This recipe should suit you fine for an 8 to 12 lb. turkey. Rinse turkey thoroughly with cold water, drain and pat dry. Prepare sweet pickle brine. Brine turkey according to the following schedule, 8 to 12 lb. bird 3 days, 13 to 16 lb. bird 4 days, 17 to 22 lb. bird 5 days. Remove from brine; rinse thoroughly in cold water and pat dry. Allow to dry in refrigerator for 24 hours. Lock wings behind back and tie legs and tail together. Baste turkey with maple syrup before putting in smoker and every 2 hours while smoking. Position turkey on cooking grill. Smoke cook until done. The best way to determine whether or not is done is to insert a meat thermometer into the thickest part of the turkey (the breast) the internal temperature should read 180 degrees F.
Smoking food is more an art than a science; this recipe is not intended for the novice. Allot of factors go into determining the cooking time for a particular food when smoking. Cool turkey in the refrigerator for 24 hours before serving to enhance the smoked flavor. You may serve the turkey right away if you wish. To make chutney: In a heavy saucepan combine water and sugar. Stir and bring to a boil. Add cranberries, vinegar, nuts, sugar, ginger and garlic. Boil slowly, stirring until thick, 5-10 minutes. Cool and refrigerate. It will keep in refrigerator up to 1 week or it can be frozen. To serve: Place Brie on the Medium Round Stone with Handles. Spread chutney over top of cheese. Bake at 350 degrees 5-10 minutes watching carefully so as not to melt brie, just to soften it. 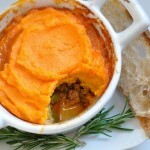 Serve with slices of bread or top your leftover turkey sandwich. I don’t know about you but my mouth is watering just thinking about it! Here is another way to use up those holiday leftovers. You can even entertain guests with this one and they will be impressed every time. I promise. In bowl, combine turkey, 1 cup of the cheese, celery, green onion if using, cranberries, parsley, mayonnaise, mustard and black pepper. Mix well. Set aside. Unroll the 2 packages of crescent rolls; separate into 16 triangles in a circle on a large pizza pan or stone with wide ends 3 inches from the edge of pizza pan and points towards the outside. Points will extend off the edge of the pan(depending on size). Arrange the remaining triangles in the center of the pan, matching wide ends with triangles already in placed. The points will overlap in center. Using small rolling pin(or small round jar or drinking glass), roll over seams of triangles where wide ends meet, making a smooth surface for filling. Don’t seal center triangles. Using an ice cream scoop, scoop filling evenly over the dough in a continuous circle. Beginning with the last triangle placed in center of pizza pan, bring point of triangle straight across filling. Next, bring point of the opposite outside triangle diagonally across filling, covering point of previous triangle. The filling will show. Repeat, overlapping points of inside and outside triangles to form a wreath. Tuck the last end under first. Brush top of wreath with egg white. Sprinkle with remaining 1/4 cup cheese. Bake 25-30 minutes or until golden brown. Enjoy! Here is a great way to use up those left-overs. Everyone is going to have different leftovers so how you follow the recipe depends on what you have left. It is quite simple – Make a sweet potato crust and mix chunks of turkey with your green bean casserole and then spread it over the sweet potato crust and top with the fried onions. It may not be gourmet but it will satisfy your family especially the kids! 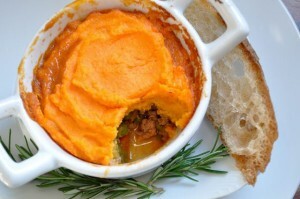 In medium bowl blend sweet potatoes, margarine and pumpkin pie spice until smooth. In 9-inch pie plate, lightly sprayed with vegetable cooking spray, line plate with potato mixture to form a pie shell; set aside. In medium bowl combine turkey, soup, beans, mushrooms, salt and pepper. Pour mixture into prepared shell. Sprinkle onions over top. Bake in a preheated 350 degree F oven for 30 minutes or until hot. Serve with cranberry sauce, if desired. Here's an easy, delicious and healthy recipe that uses diced leftover turkey. From the FoodNetwork follow Alton Brown on his mission to throw off the dry turkey curse that’s haunted his family for ages. Can he unlock the secrets to a juicy turkey that cooks in just two hours? A turkey’s not just for Thanksgiving! Enjoy this delicious meal for any Holiday feast. Learn how to carve a turkey – Watch a Video! Hold meats steady and make even the thinnest slices picture-perfect. They tuck neatly into a metallic black, wooden storage case trimmed with the elegant look of brushed nickel. Knife, 8 1/4″ blade; fork, 4″ tines.